Ask your doctor about your post-stroke limitations BEFORE you start an exercise program! Resistance training increases muscle mass and strength. 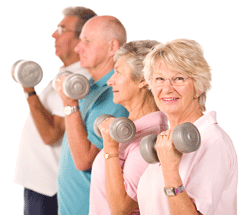 Increased strength can mean greater independence, better functional mobility and fewer falls. To gain health benefits, muscle-strengthening activities need to be done to the point where it’s hard for you to do another repetition without help. A repetition is one complete movement of an activity, like lifting a weight or doing one sit-up. Try to do 8–12 repetitions per activity – that counts as 1 set. Try to do at least 1 set of muscle-strengthening activities, but to gain even more benefits, do 2 or 3 sets. There are many ways you can strengthen your muscles, whether it's at home or the gym. The activities you choose should work all the major muscle groups of your body (legs, hips, back, chest, abdomen, shoulders, and arms). Resistance training should be done at least two times a week, but never on consecutive days. Muscles need to rest and repair for 48 hours between workouts. Fun and Fitness class demonstrates leaning push-ups — a core-strengthening exercise. Water bottles make great light weights for shoulder exercises.